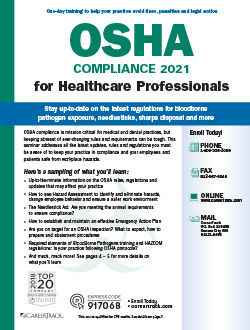 OSHA has developed today's medical and dental practice standards to ensure a safe, hazard-free environment for you, your staff and your patients. You may be "pretty sure" or "almost certain" you're in compliance with OSHA's latest standards, but with OSHA, there's no margin for error. This seminar was designed to cut through the confusion and hone in on what you need to know to ensure your practice is fully compliant. Noncompliance with OSHA is serious business, and can cost your practice dearly. In fact, a single citation for a serious violation can carry a monetary penalty of up to $7,000, while repeat violations may reach upwards of $70,000! Don't just think you're in compliance … know you are! In addition to complying with OSHA's general industry standards, medical and dental practices must also follow the OSHA guidelines, rules and regulations that apply specifically to medical hazards, risks and safety procedures. Just one day of focused training ensures your practice is OSHA compliant and inspection-ready. Ionizing radiation requirements: Does your practice meet OSHA's four standards? Protective equipment: What's required under OSHA? What are the minimum acceptable labeling requirements under both the BBP and HAZCOM regulations? Sharps injury logs — is your practice exempt? Exit routes: Is your signage visible, legible and illuminated according to OSHA standards? Electrical concerns in your practice: What you should be aware of regarding office equipment, sterilizers, centrifuges, ECG, radiograph machines, etc. OHSA inspections: Could your practice be selected? Do you need MSDS on file for common cleaning solutions like Windex® ?